The intersection of Sardar Patel Road and Anna Salai (Mount Road) is still known as the Halda Junction, though chances are that very few of the present generation would even know of the Indo-Swedish collaboration that once dominated that corner. But while it lasted, it was a name to reckon with. It owes its name to M(adipakkam) Rajagopal Naidu, who began his career in 1915 or thereabouts as a mechanic with Simpson’s and later moved up the ladder at Addison’s. In 1922, or thereabouts, he left to start a business of his own. The first contract was from Simpson’s to assemble fire pumps from the completely knocked down kits that the Company was importing. This proved successful and, emboldened by this, and also realising that automobiles were the business to be in, he launched Rajagopal Motor Works, with workshops on Lang’s Garden Road, Pudupet. In a way he was one of the founders of the auto parts hub that Pudupet has now become. The Company then diversified into dealerships for cars and trucks, with office and showroom at the intersection of Ritchie Street and Mount Road. As a matter of policy he took on only cars that were not of British origin – American models from the Hudson Motor Corporation and French ones from Renault. Business was good, and with the returns Rajagopal Naidu invested in real estate, buying up successively large tracts of land in the newly developed T’Nagar area, and, later, the Western Castlet on Mount Road. During World War II, the retailing of gasonators – plants producing gas as substitute for petrol – brought in more money. So too did running bus services in the mofussil, with his Sri Venkateswara Bus Union being the first company to ply up and down the ghat roads at Tirumala. It was said that Rajagopal Naidu himself steered the first bus down the hill. He also ran cinema theatres in Tirupati. That was a time when typewriters, for some reason, went along with the vehicle business. Rane sold them as did the once prominent firm of Byramshaw’s on General Patter’s Road. The Swedish firm of AB Atvidabergs Industrier was looking for a local partner who could represent its brand of Halda typewriters in South India and, in 1944, Rajagopal Naidu signed up. The new business, styled Rayala Corporation, after Rayalaseema from where the founder came, had the Rajah of Bobbili as its Chairman. The offices were in the Western Castlet, Mount Road. M.R. Pratap, Rajagopal Naidu’s eldest son, handled the actual business and it made a name for itself, with Halda becoming the third most preferred brand in South India, after Remington and Underwood. With Independence, the new Industrial Policy mandated developing of indigenous manufacturing. Calcutta, Bombay and Madras were the three port cities that received the bulk of the industrial licences for various products and typewriting was no exception. Remington, Godrej and Rayala were the three licensees, respectively in each of the three cities. Godrej was the first off the mark, launching the first Indian typewriter in 1954. Remington followed in 1955 and, on March 13, 1956, Rayala successfully assembled the first Halda typewriter at the Western Castlet. The launch was overshadowed by the death of the founder ten days later. M.R. Pratap took over as Managing Director of the fledgling company. He gave up his interests in all the other businesses of the family to focus on Rayala and its Halda typewriters. By then, Atvidaberg AB had been taken over by Facit, which launched typewriters under its own name all over the world. India, however, being a conservative market, the old brand name was allowed to remain, thereby making it the only country that sold Halda machines. The facility at the Western Castlet was but a makeshift one and work was going on simultaneously on building a factory set in a vast expanse of empty land in Guindy. The Economic and Political Weekly noted in February 1960 that the machinery and tools had arrived at Madras. “This is the first time that the Facit Group, collaborators of the Rayala Corporation, are helping in setting up a factory outside Sweden,” it recorded. The Company, it said, was sending its technicians to Madras to help in the setting up of the plant and was, in turn, also training Indians in Sweden. “The Facit Group has assured that it will go all out to develop full production in Guindy to meet the specific progressive manufacturing stipulations of the Government,” the article noted. At its peak, the Halda factory spanned over 40,000 square feet of constructed area, employed over 450 workmen and produced typewriters in just about every Indian language, of course including English, Nepali, Sinhala and Arabic, the last requiring everything to work in reverse. The technology, involving over 1,800 parts largely of steel and aluminium, was considered intricate and the factory received enormous press coverage. Located as it was in what was the southern border of the city, the facility became a landmark and lent its name to the junction. The Swedes were an exotic presence, and at least one, Gosta Rundberg, came as a technician, stayed on to become Director, helped found Facit Asia, an independent entity that made calculating machines, and wound up as President of the Madras Club! When he and his wife left India, it was after a tenure of 23 record years. Sadly for Rayala, and Halda, battles between the promoters saw a plethora of court cases during the 1960s and 1970s. That put all expansion plans on hold. By the time matters righted themselves, it was somewhat late. Rayala did try a comeback with Olympia electronic typewriters in collaboration with the eponymous German company in the 1980s. But the sweeping computer revolution of the late 1980s meant it did not have long to survive. The factory was relocated on the Old Mahabalipuram Road, where it eventually shut down, though the Company as such went on to other businesses. 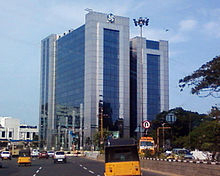 The land in Guindy was put up for sale and was eventually acquired by Ashok Leyland Limited for its corporate office. But where it was, is still referred to as the Halda Junction! © 2015. All rights reserved. Madras Musings.